KYBELLA™ is the only FDA-approved nonsurgical treatment that contours and improves the appearance of submental fullness, sometimes referred to as a “double chin”. If you are bothered by a double chin or submental fullness, schedule a consultation and we can give you an individualized examination and discuss the best treatment options for you. The active ingredient in KYBELLA™ is a synthetic version of a naturally-occurring substance that is produced in your body called deoxycholic acid, which is related to the breakdown and absorption of fat. When Kybella™ is injected below your chin it breaks down and destroys the fat cells forever! You and your doctor will decide if Kybella™ is right for you and then customize your KYBELLA™ treatment regimen. If you need a series of injections then they are spaced a month apart or more. Many people have visible contour improvement in their profile in two treatments but up to 6 treatments may be administered. 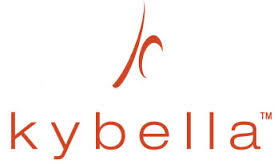 The safety profile of KYBELLA™ is well characterized. The most common side effects are swelling, bruising, pain, numbness, redness and areas of hardness around the treatment area that improve with time. Contact us for more information. The product destroys these fat cells permanently. Once destroyed, those cells cannot store or accumulate fat so retreatment is not expected. Clinical trials and investigations failed to show submental fullness recurrence in treated patients even with continued overall weight gain!